3 C3, Noor Jehan Road, Gulberg III,, LAHORE, Gulberg III. Indigo Developers is relatively a new real estate developer, but with incredible enthusiasm and a strong vision for the real estate sector of Pakistan. To live up to our slogan “Setting New Trends” we as a company always strive to meet new challenges to bring quality and customer satisfaction remain fully integrated. After successfully delivering “Faran 101”, a 9 floor, 50,000 sq ft real estate project in Bahria Town, Rawalpindi, our new project “Indigo Heights” is on an even greater scale with 22 floors and construction area of 170,000 sq ft. The quality of Indigo Heights would truly reflect world-class construction quality, top-notch ergonomic design. We offer an investment opportunity in one of the most premium and sought after real estate and commercial properties of mega cities of Lahore, Islamabad, Rawalpindi and more in Pakistan. BMS is a centralized system that interlinks functionality of individual building equipment to function as a single integrated system. BMS is a microprocessor based “Intelligent” controller of various networks installed to monitor and control buildings technical systems and services such as lighting, air conditioning, ventilation, and hydraulics, escalators and lifts. Adding to the beauty and commercialism of Lahore, Indigo Heights is another unique and high standard residential and commercial destination. This project is made investor friendly by putting some clauses in the contract that are not found in any other residential or commercial property. The property provides a number of facilities regarding many things especially the installment and payment plan which makes it extremely user friendly. All the apartments and the construction of the building are made using the best quality raw material and a lot of detail work has been done in making the project possible. Lahore has a big population and has areas with extreme living conditions. There are areas that don’t have good living conditions and then the areas where there are the best living conditions and this makes Lahore one of the most loved cities as everyone is welcome there and people live together with a lot of love. The building has 22 floors that are very strategically divided into residential units and commercial area. All these apartments are of highest standards and the most amazing thing about these apartments is that they are extremely spacious and comfortable. The one bedroom apartments are available on 6 floors and all these are beautifully designed and carried out. The floors on which these apartments are available are 6th, 7th, 8th, 9th and 10th. 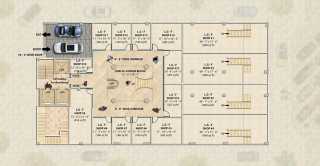 The price per sq ft is 15,500 and the total area of the apartment that has 1 bedroom is 630 sq ft. This makes the price of the place very reasonable and easy to afford. The building also offers 2 bedroom apartments. These two bedroom apartments due to the increase in the area are also very spacious and easy to live in. 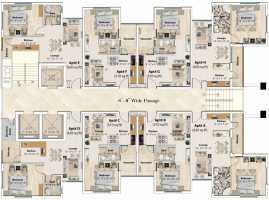 the total area of these apartments is 1100 sq ft and these apartments are available on 4 floors in total. These floors are 11th, 12th, 13th and 14th. The price per sq ft in this case is also 15,500. There are also 2 floors on the top that are only the penthouses. Indigo Heights a mixed-use high-rise state of the art building offers five contiguous floors for commercial activities (LG, Ground, 1st, 2nd & 3rd Floor). The unique location of Indigo Heights makes it an ideal for commercial shops, business, and trading activities. Commercial Real Estate (CRE) is simply meant as any property bought to get an income by doing some business, trade or sale or purchase of goods. According to a survey, more than 150,000 vehicles would cross it every day. The building would be equipped with a centralized BMS building management system and a fully managed car parking system to park 200+ cars in 3 underground basements. Buying a commercial shop at Indigo Heights is a sound and secured investment as real estate in Gulberg rises annually 20 to 25%. The management offers 7% rental guarantee and 6% completion guarantee as the expected time of project completion is 31st December 2018. Surrounding posh areas of DHA, Cavalry Ground, and Model Town makes Indigo Heights inevitable and most lucrative to own a commercial shop. Main Boulevard Gulberg has emerged as modern downtown of Lahore city, with high-rise buildings and elite class famous shopping spots like Liberty Market, Main Market, MM Alam Road. The new dimension of Gulberg in today’s era is all-new financial, trading and business hub. Indigo Heights exquisite building is well integrated into the posh surroundings and destined to attract existing and new customers due to its prominent location at 3 C3, Noor Jehan Road, Gulberg III. Indigo Heights has a lot of edges if compared with competitors as commercial shops are offered at discounted rate, and in easy to pay installments. Commercial shops for sale and rent starts from a smallest covered area of 120 sq ft to largest 1588 sq ft. These high-end shops are ideal for foreign brand, Electronics, Cosmetics Store, Electrical Appliances, Pharmacies, Toys, Gaming Stores and Boutiques. Book your commercial shop by just paying 10% down payment with due construction stage wise installments, for prosperous and booming business of yours. There is flexible and easy payment plan for the investors to feel comfortable and easy. Indigo Heights presents properties with a 20% decreases in the prices in comparison to what the surrounding market asks for. The payment has to be paid in a systematic way. The buyers can pay a 40% of the total price in the beginning and as soon as they pay all the easy installments, they can write the property in their name. The registry of the property with GOP is done at the time of full payment. A Luxury Apartment automatically means a stress-free relaxed and luxurious life. Our 1-bed luxury apartments are carefully designed to efficiently use spaces, deploy latest storage solutions with a style that appeals to you and to everybody visiting apartment. Buying a luxury apartment for sale in Gulberg Lahore portrays your aesthetics sense and ultimate urge for fabulous interior decoration. 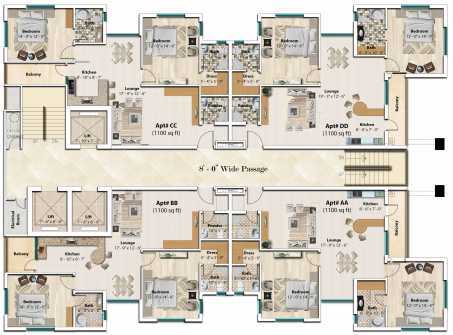 510 and 630 sq ft luxury apartments for sale or rent in Gulberg Lahore represent mastery of intelligent design, organized management of spaces to reflect your own style, also it’s a nice value addition to your owned real estate. Indigo Heights have dedicated 5-Floors having 2 Types of 1-Bed Luxury Apartments on each floor (6th, 7th, 8th, 9th & 10th Floors) with 8 ft. wide corridor. 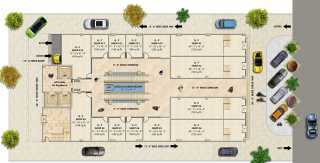 There 4 Luxury Apartments of 510 sq ft and 4 Luxury Corner Apartments of 630 sq ft each. Discover the Gulberg’s most desired 2-Bed Luxury Apartment that spark ideas for your future remodeling plans and retreats. 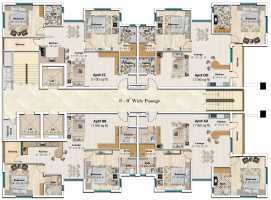 2-Bed Luxury Apartment is truly a depiction of your lifestyle, personal preferences, and desires. At Indigo Heights our vast exposure in building and developing luxury apartments for sale, has enabled us to present most stunning 2-Bed Luxury Apartments in design. These Apartments are built to satiate your urge of extra luxurious, spacious living and top-notch interior design thrust.2-Bed Luxury Apartments are fully serviced apartments, broad daylight gives you a refreshing look all day long and in the night you can watch the scenic beauty of Liberty Market and MM Alam Road hustle and bustle. Hot spots both local and international restaurants, brands and traditional shops are all out there and in the Indigo Heights to give a maximum comfort to apartment owners.Dedicated car parking, separate entrance lobby for apartment owners and 2 exclusive lifts and 1 cargo lift to handle your stuff transportation, Facility Management System, option of virtual office and whole floor dedicated to modern amenities makes a perfect balance between high-end living and business environment.A spacious 8 ft. corridor between apartment rows gives a decent entrance to apartments. 2 Bed Luxury Apartments have one powder room for your guests and visitors to maintain your privacy. Embrace the impressive and thriving culture of one of Gulberg’s most notable locations, Indigo Heights offers fully serviced apartments and commercial shops unmatched in both quality and luxury that you can afford, right in the heart of Gulberg. It is our firm commitment to provide a comfortable living experience to our apartment owner. Each Luxury Apartments has a covered area of 1100 sq ft.
Shops Sizes: 180 sq ft, 285 sq ft, 418 sq ft, 548 sq ft, 1588 sq ft.
Price per sq ft: Rs. 95,000. Rs. 85,000 for 1588 sq ft shops only. Note:The 1588 sq ft shops are two floor shops split between Ground Floor and Lower Ground Floor, 720 sq ft and 868 sq ft respectively. Shops Sizes: 139 sq ft, 180 sq ft, 205 sq ft, 285 sq ft, 418 sq ft. Price per sq ft: Rs. 95,000. Rs. 85,000 for 1588 sq ft shops only. Commercial Floor:First. 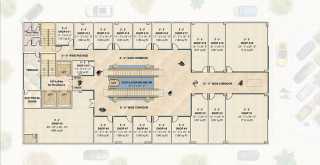 Shops Sizes: 120 sq ft, 151 sq ft, 180 sq ft, 297 sq ft, 712 sq ft, 984 sq ft.
Price per sq ft: Rs. 45,000. Rs. 50,000 for 712 sq ft shops only. Shops Sizes: 120 sq ft, 151 sq ft, 180 sq ft, 297 sq ft, 712 sq ft, 984 sq ft.
Price per sq ft: Rs. 35,000. Rs. 40,000 for 712 sq ft shops only. Commercial Floor: Third. Shops Sizes: 120 sq ft, 151 sq ft, 180 sq ft, 297 sq ft, 712 sq ft, 984 sq ft.
Price per sq ft: Rs. 30,000. Rs. 35,000 for 712 sq ft shops only.